The disc jockeys on the pirate stations tended to move around, a number of them being involved with one or more of the 'top' stations at one time or another and very few of them saw it out on any one station from start to finish. This movement was not always immediately noticeable as some of them also worked under assumed names which they changed, or had changed for them, when they joined another station. 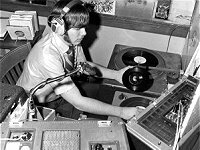 During its lifetime Radio Caroline South employed at least 67 disc jockeys of which only 13 stayed for a period of more than a year. Radio Caroline North employed about 38 disc jockeys of whom at least 22, including Dave Lee Travis, also spent time on the South station. Many of them subsequently found employment on either Radio 1 or the local radio stations as they came online. Of some of the more well-known names, Radio Caroline's original disc jockeys were Simon Dee, Chris Moore, Donny Kerr, Tom Lodge, Gerry Duncan and Carl Conway. They were later joined by Dave Lee Travis, Emperor Rosko, Tony Blackburn, Colin Berry, Tony Prince, Bob Stewart, Tommy Vance and also Johnnie Walker and Roger Day who moved from Radio England. Andy Archer moved there, from Radio City, as did Tony Allan and Steve Merike who came from Radio Scotland. Radio London had, at various times, Keith Skues, Pete Brady, Tony Brandon, Dave Cash, Chris Denning, Pete Drummond, Kenny Everett, Duncan Johnson, Paul Kaye, Lorne King, John Peel, Ed 'Stewpot' Stewart and Alan West (later Radio 355). They also had Tony Blackburn, Norman St.John and Tommy Vance who moved from Radio Caroline, Chuck Blair and Graham Gill who moved from Radio England and Mark Roman from Radio City. Tony Windsor and Dave Dennis (previously known as Neil Spence) moved there from Radio Atlanta. Radio Luxembourg's list of disc jockeys is far too long to recite and reads like a who's who of radio broadcasting. It includes (in no particular order or era) Barry Alldis, Tony Blackburn, Tommy Vance, Emperor Rosko, Keith Fordyce, Pete Murray, Tony Prince, Dave Jensen, Jimmy Savile, Jimmy Young, Mike Hollis, Desmond Carrington, Stuart Henry, Alan Freeman, Kenny Everett, Noel Edmonds, Roger Day, Dave Christian, Bob Stewart, Chris Denning, Colin Nichol, Don Moss, Don Wardell, Geoffrey Everett, Jack Jackson, Johnnie Walker, Johnny Moran, Mark Wesley, Ray Orchard, Sam Costa, Stuart Grundy, Tony Brandon and Paul Burnett, many of whom also worked on the pirate stations and Radio 1 (though not all at the same time!). Many of the names mentioned above, and a whole host of others, have subsequently achieved further recognition through B.B.C. national radio, B.B.C. regional radio, Independent commercial stations and, of course, television in various capacities. Here are some bits about just a few of the disc jockeys who made the Sixties swing. . . . 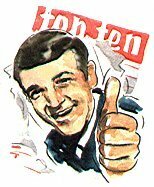 The Australian legend joined the BBC from Radio Luxembourg in 1960 and found himself presenting 'Pick Of The Pops' on Sunday afternoons by 1962 with his 'Greetings, pop-pickers', 'Not 'arf', and 'Alright?' punchlines. You may also remember seeing him in Sixties TV adverts for 'OMO' washing powder. First broadcast in June 1966 for Radio 390 and subsequently went to Radio 2. Did a 4-hour show at Radio 390 before finding out that engineers had forgotten to switch on the transmitter. First broadcast 1965 on Radio Caroline South, newsreading and sponsored programmes. Joined Radio 1 in 1972 via an announcing job at HTV. Radio London disc jockey who moved to Radio 1 in 1967 presenting 'Midday Spin' and 'Radio One Club'. First broadcast August 1964 on Radio Caroline South after answering an advert in a music newspaper. He moved from there to Radio London and Radio Luxembourg before joining the original Radio 1 team, presenting their first programme in 1967. Became a 'Top Of The Pops' presenter on television and also had chart record hits in the Sixties with 'So Much In Love' in 1968 and 'It's Only Love' in 1969. First broadcast for the Aden Forces Broadcasting Association. On leaving the R.A.F. he joined Radio 270, moving from there to Radio Manx and then Radio Luxembourg in 1967 where he presented the Top 20 show for six years before taking over the Saturday Morning Show on Radio1. First broadcast 1946 in Rangoon, Burma, after the Japanese occupation. He worked extensively for Radio Luxembourg during the Fifties, starred in the television series 'Emergency Ward 10' with Richard Chamberlain and presented the 'DAZ' commercials for nine years before joining Radio2. First broadcast for station CFUW Vancouver in 1963. Joined Radio London on his return to the U.K. presenting the 'Kenny and Cash' show with Kenny Everett. Has subsequently worked on Radios 1, 2, Luxembourg and also Capital Radio, again with Kenny Everett, in a recreation of the Radio London show. First broadcast for Radio 1 on 21st July 1969. He got his break on radio when he stood in for an ill Kenny Everett on the Saturday Morning Show. He also presented the Radio 1 Breakfast Show and the 'Top Of The Pops' television show before branching out into various television enterprises. First broadcast for Radio 390 in November 1965. He joined Radio 4 in the mid-Seventies as a newsreader / announcer. First broadcast for Radio London in the mid-Sixties, presenting the 'Kenny and Cash Show' with Dave Cash. Moved to Radio 1, Radio 2, Capital Radio and has presented many television comedy programmes as well as BBC's 'Top Of The Pops'. First broadcast 'The Anti-City Show' on Radio City in 1965. Subsequently moved to BBC Radio Leeds. First broadcast in 1948 on the British Forces Network while in the R.A.F. Subsequently worked for Radio Luxembourg and BBC Radio. Best remembered as co-presenter of the 'Ready Steady Go' television pop programme with Cathy McGowan although he has done many other notable pop programmes. First broadcast on Radio Scotland. Presented 'Midday Spin' on Radio 1 when it opened in 1967 and subsequently moved to Radio Luxembourg in 1974. First broadcast for Radio City in 1966, in which year he won the 'South Coast Disc Jockey Of The Year' award presented by Melody Maker. He joined Radio 1 in 1968, subsequently working for independent local radio before returning to the BBC on regional station radio. Son of band-leader Geoff Love, he first broadcast for Radio City in 1966. Subsequently he worked on the BBC Light Programme, the World Service, London's LBC, Capital Radio, BBC Radios 1 and 2, British Forces Broadcasting, County Sound, Jazz FM, Classic FM and BBC Southern Counties Radio. First heard in the U.K. broadcasting for Radio Luxembourg in October 1968 which he joined after talking to a visiting Radio Caroline D.J. at the Canadian radio station where he was working. First broadcast in 1966 on Radio Scotland, subsequently joining Radio Medway in 1970. First broadcast as a continuity announcer at Granada television, joining Radio 1 in 1967 and subsequently moving to Radio 2. First broadcast for the BBC World Service in April 1943. He went to Radio Luxembourg on a three-month replacement D.J. job and stayed for five years before rejoining the BBC where he has worked for both the Radio (mainly Radio 2) and Television stations. He was a regular on 'Thank Your Lucky Stars' and also, alongside David Jacobs, on 'Juke Box Jury'. First broadcast for BBC Radio Scotland in August 1966 having previously been employed in some capacity on a pirate station, presumably Radio Scotland. Subsequently became the Music Controller at Radio Clyde. First broadcast as a D.J. compering 'Disco A Go-Go' on TWW, the show on which Tony Blackburn made his debut as a pop singer. From there he moved to Radio Caroline, staying for two years before joining Radio Luxembourg in 1968 as part of their first 'live' team of disc-jockeys which also included Paul Burnett and David 'Kid' Jensen. First broadcast for the BBC European English Service on 9th February 1966 before becoming one of the original Radio 1 presenters in 1967. He has subsequently worked for both Radio 2 and Radio 4. First broadcast on Radio England in 1966 before moving to Denmark Radio and the 'Voice Of Peace' ship off Tel Aviv in 1976. He has since worked for regional radio stations. First broadcast for the British Forces Network while in the R.A.F. From there he joined Radio London and was one of the opening line-up for Radio 1 in 1967. First broadcast for Radio Caroline in 1964, subsequently moving to Radio Luxembourg. Joined Radio London in 1965, becoming one of the original Radio 1 disc jockeys in 1967 and subsequently doing work for Radio 2 and BBC television as a children's presenter. Unusual picture of Ed at Big L.
First broadcast for BBC Schools Television in 1953. He has worked for Radio Caroline, Radio Luxembourg, Radio Monte Carlo and also Radio 1 besides doing programmes for BFBS and the World Service. He also presented 'Top Of The Pops' on BBC television. The 'Hairy Monster' first broadcast in 1964 on Radio Caroline South where he stayed for two years before doing six months at Radio Caroline North. From there he went to BBC Manchester, joining Radio 1 shortly after it opened in 1967. Has subsequently appeared in many radio and television shows. First broadcast as a member of 'The Vipers' skiffle group in 1957. He went on to present 'Skiffle Club', 'Guitar Club', 'Folk Room' and many other shows for BBC Radio as well as being a popular children's television presenter, particularly in 'The Five O'Clock Club' with Muriel Young and Bert Weedon. First broadcast in 1961 for station WRR in Dallas, Texas, presenting a r&b show called 'Kats Karavan'. He joined Radio London on his return to the U.K. where he created the cult 'Perfumed Garden' programme and then moved to Radio 1 ('Top Gear'), Radio 2 ('Night Ride') and Radio 1 ('The John Peel Show' and 'Sounds Of The Seventies'). He has also presented television's 'Top Of The Pops' and done work for the World Service and BFBS. John sadly died of a heart attack in 2004. Savile was one of Radio Luxembourg's main disc jockies in the early Sixties, hosting the 'Warner Brothers Record Show', 'The Teen And Twenty Disc Club' (where he awarded Elvis Presley his first British gold disc in 1960) and the 'Guys, Gals And Groups' show. He made a minor pop record in July 1962 titled 'Ahab The Arab' and hosted the first BBC 'Top Of The Pops' television programme, from Manchester, on January 1st 1964. He subsequently worked for Radio 1 and BBC TV. First broadcast in 1953 on BBC's 'Flat Spin'. By 1955 he had already had hit pop records and was presenting 'Housewives Choice'. That year he had two consecutive No.1 hit records, the first British artist to do so. During the late Fifties and early Sixties he hosted many radio shows including 'The Night Is Young', '12 o'Clock Spin', 'Younger Than Springtime' and 'Keep Young'. His last chart record was 'Miss You' in 1963. He was moved to Radio 1 when it opened in 1967, was named 'Radio Personality Of The Year' in 1968 and moved to Radio 2 in 1973. He has also hosted his own television programme. Worked for the BBC forever in virtually every capacity. Major radio shows he has hosted include Housewives Choice, BBC Jazz Club, Pick Of The Pops, Melodies For You and he also chaired the Radio 2 lunchtime programme for six years. He has many cinema and television acting credits and has also hosted many big television shows, notably Come Dancing, Miss World and The Eurovision Song Contest. He is probably best known as chairman of the long-running television pop show 'Juke Box Jury'. David had the distinction of being voted Britain's Top Disc Jockey for six years and was the Variety Club of Great Britain's T.V. Personality of the Year in 1960 among his many other awards. For a huge amount of information on Radio London, pirate disc jockeys and the subjects of their current DJ personnel searches, click on the logo to see the fabulous Studio Anorak / Radio London website of Mary and Chris Payne. According to Bob LeRoi there were countless other DJs, some only appearing once or twice and seldom earning more than £5 a week! Birgit David, Gitte Muller, Hannah Ralf, Helle Schmidt, Jytte Weiss, Grethe Sonk, Ida, Käte Mundt, Lilly Broberg, Lise Reinaud, Inger Marie, Clara Pontoppidan.